In Vermont , cemeteries are primarily the responsibility of local communities and private landowners. Many communities do not have the resources for maintenance, restoration and preservation of cemeteries. 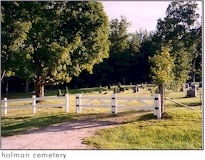 Salisbury, Vermont has three cemeteries: the Village Cemetery, the Holman Cemetery and the West Salisbury Cemetery. The Village Cemetery is located in the Village at the south end of Prospect Street. The entrance to Prospect Street is located next to the Town Hall/Public Library building in the center of the Village. The Holman Cemetery is located approximately one mile northwest of the Village on the west side of Route 7 at its intersection with Holman Road.